I've often thought that I would like to take more opportunity to prepare for Easter. This year, I planned a project for my family that had the added benefit of allowing me to meditate on the truths of Easter in an artful way. not part of God's people, etc. bore the wrath of God, etc. being built into a Temple for the Lord, etc. There are so many of these scattered throughout the Old and New Testaments. I didn't find them all but I did find enough to give me a window into the depth of what happened on that day. I copied the descriptions of Christ's work onto an art board in the shape of a tree with sepia artist pens.This was actually my favorite stage of the project. Writing things out by hand has a special power to sink them into my heart, I've found. And having to do it artistically caused me to slow down even more as I wrote each word. Michael's had some gray slate stones that I used to write the descriptions of our condition before Christ. The descriptions of our new identity in Christ went on paper butterflies that I punched out of bright card stock. I love how you can bend their wings out for a 3D effect. Using a small easel, I set up the word tree on our coffee table in the days leading up to Easter. Then one evening for family devotions our family took turns reading the descriptions of our lives without Christ that were on the stones. 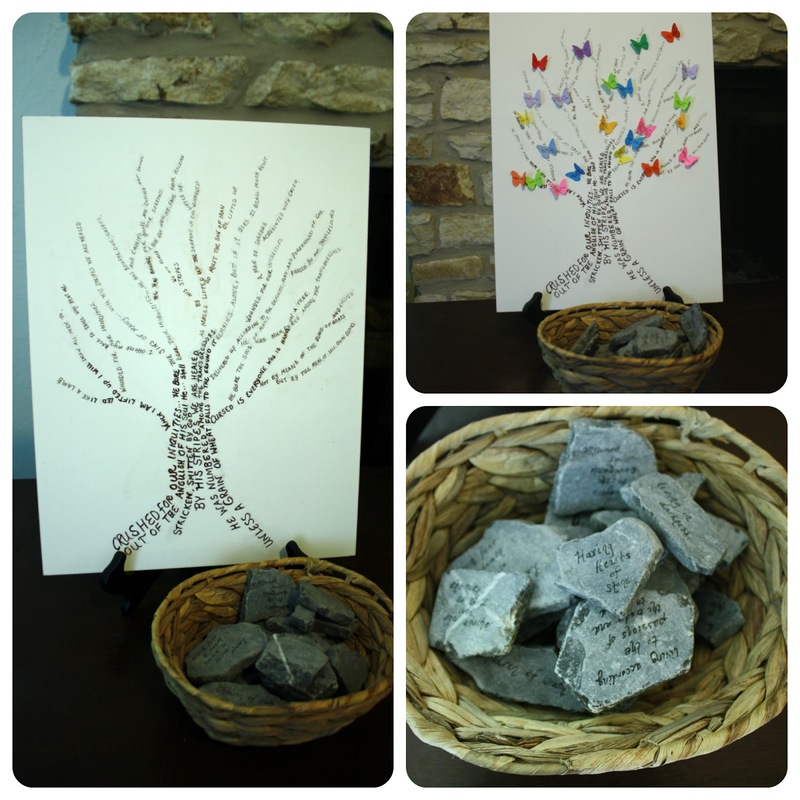 Each person picked up a stone, read it and placed it in a small basket at the foot of the easel. In the middle of doing this, my husband and I realized that it would be good to have the person also give a short paraphrase in their own words. It was neat to hear the kids work on explaining what they thought each Bible phrase meant. The younger kids who couldn't read their stones still liked participating by choosing a rock, having someone else read it and placing it in the basket. Then on Easter, we took out the butterflies and did the same thing, this time pinning them to the branches of the tree. It was a special, reflective time that I think we will try to repeat next year. I'll miss the time spent making it next year though. I'll have to think of a new way to reflect in the months beforehand. Any suggestions?